I wonder if this Trump is a relative to “the Donald”? The pub date alone tells you this is weed-worthy, but I do like some of these scams before the Internet was a thing. My favorite is raising chinchillas. Almost every magazine from the olden times had some kind of chinchilla scheme advertised in the back. As a kid, I was fascinated by such a project. Consumer protection information goes out of date so fast. I can’t imagine why this particular public library wants to hold on to this copy (and even sent it to the bindery). Time to let go and move into this century. While it’s obviously too dated to be useful, this is still pretty fascinating. I remember a vanity press trying to scam me back when I was a student – it was under the guise of a poetry contest; there was no entry fee but then they wanted me to shell out for the book that was supposedly publishing my poem. Yeah. 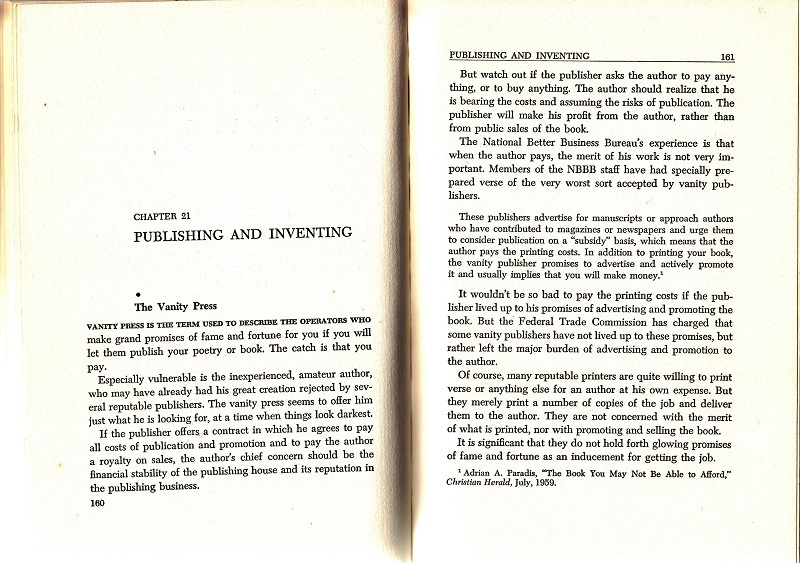 The vanity press information is still timely—though of course, I know a lot of people who think it’s worth going that route to get published. It makes me wonder how many of these scams are still around, just worked through the Internet. 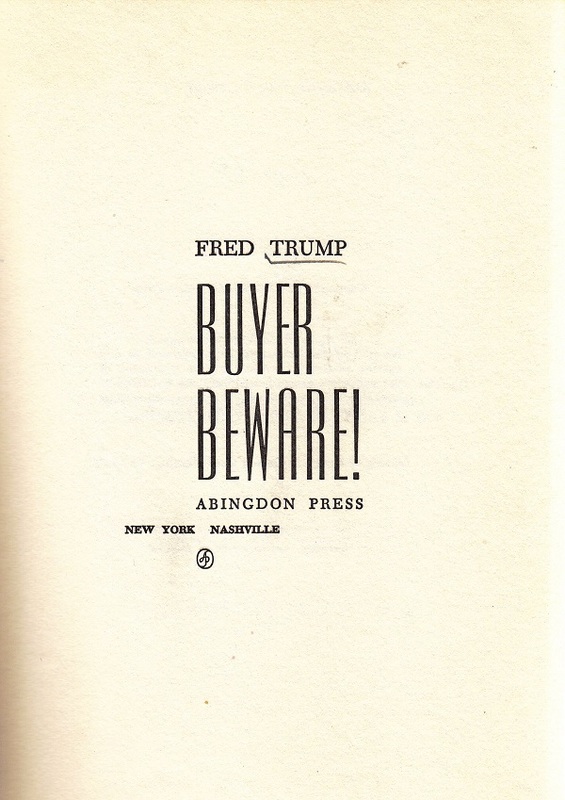 Fred Trump is The Donald’s father’s name, but I doubt it’s the same Fred Trump. Interesting. Abingdon Press is the publishing house of the United Methodist Church. One would expect them to publish titles with at least some religious or inspirational slant. Perhaps they thought that Christians might be especially vulnerable to scams, and wanted to protect the flock? From what I understand, vanity presses are still very much a trap, for essentially the same reasons given here. 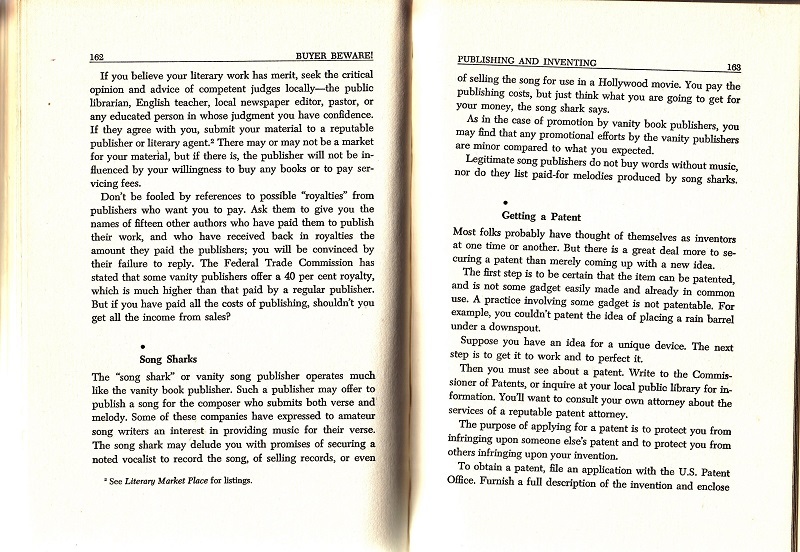 One problem not mentioned here is that the vanity press may acquire the rights to your work, leaving you legally unable to publish it elsewhere. Even if you think you know what you’re getting into, check that fine print carefully! I only remember Sea Monkey schemes…wasted years of bubble gum money on em, too. I always enjoyed the “send your bank account number to Nigeria and you’ll get millions” scheme. It was in paper before it went online. My dad was listed in some business directories and he would get letters about once a month. He saved them because the stamps were cool. 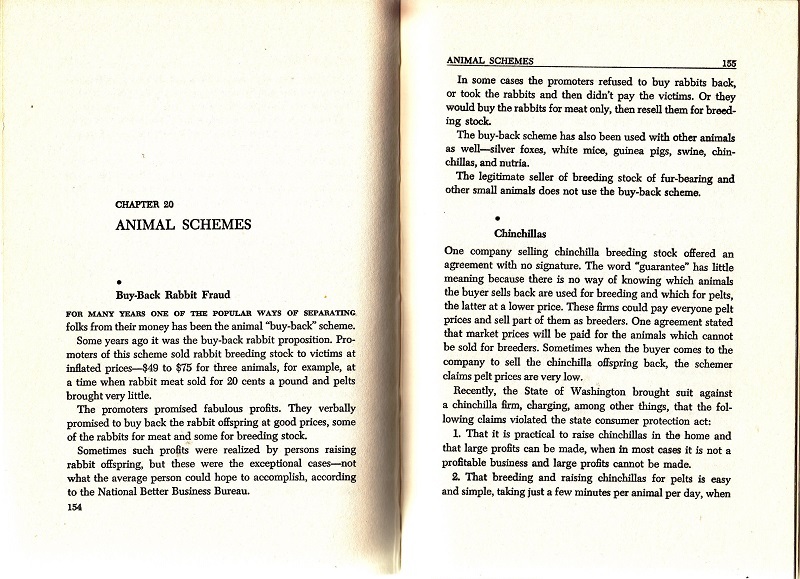 A Chinchilla scheme? Really? Wow. I’ve led a sheltered life, apparently. Chinchillas. The most terrifying thing about this book is that it advises aspiring authors to consult *the public librarian* on whether their work has literary merit and should be submitted to publishers. Please don’t do this to me, aspiring authors!